‍Boil the beans in salted water. Add the bulgur and more salt. 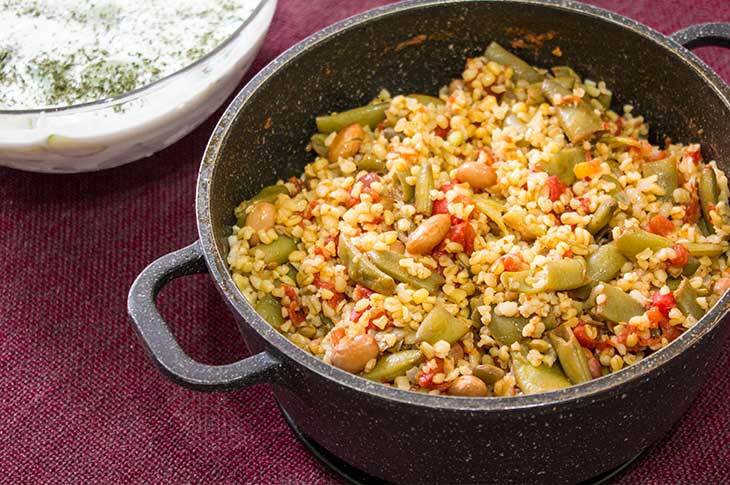 Cook on low heat till the bulgur is cooked and the water is absorbed. ‍Sweat the onion in the vegetable oil. As soon as it starts to brown turning off the heat. Pour the oil and the onion on the pilaf and cook for another 10 mins on very low heat. If the bulgur is dry, add boiling water and cook until the water evaporates. Let the pilaf rest for 10 mins. Fluff the pilaf with a fork before serving.